I found this recipe a few years ago and adapted it to my taste. This is my go-to recipe when I want to whip up an extraordinary hor d’oeuvre in a hurry! If you use a panini grill, you will make quick work of grilling the zucchini slices. Brush zucchini slices with olive oil on both sides. Sprinkle with the salt and pepper. Grill until tender, 2 to 3 minutes; you want them cooked so that they bend easily without breaking, but not overcooked. NOTE: You can make the grilled zucchini a day ahead and store in an airtight container in the fridge. In a small bowl, combine the creamy goat cheese, fresh herbs, orange and lemon zests and lemon juice, mashing them together with a fork. Put ½ teaspoon of the cheese mixture about ½ inch from the end of a zucchini slice. Top with a spinach leaf and one small or half of a large basil leaf. Roll up and place seam side down on a platter. 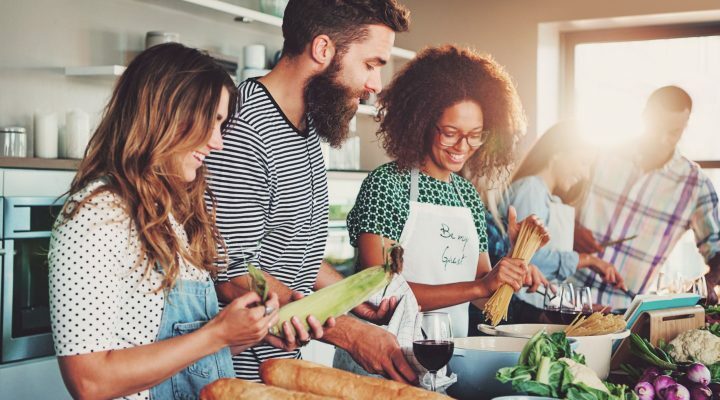 You may want to secure with a toothpick or small bamboo skewer for guests, but the roll should stay closed without securing. Repeat with the rest of the zucchini slices and serve. 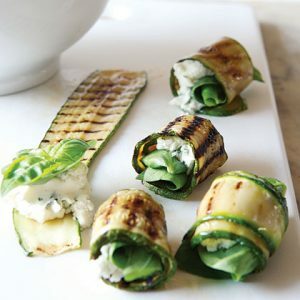 Summer-Light entertaining idea: If you serve these zucchini roll-ups along with various olives, a couple of nice cheeses and a steamed artichoke with light lemon cream dip, you have a PARTY!! For my Light Lemon Cream Dip: 1 cup non-fat Greek yogurt, 2-3 Tablespoons olive oil mayonnaise, 1 Tablespoon lemon juice and zest of one whole lemon, a little salt and rinsed capers.